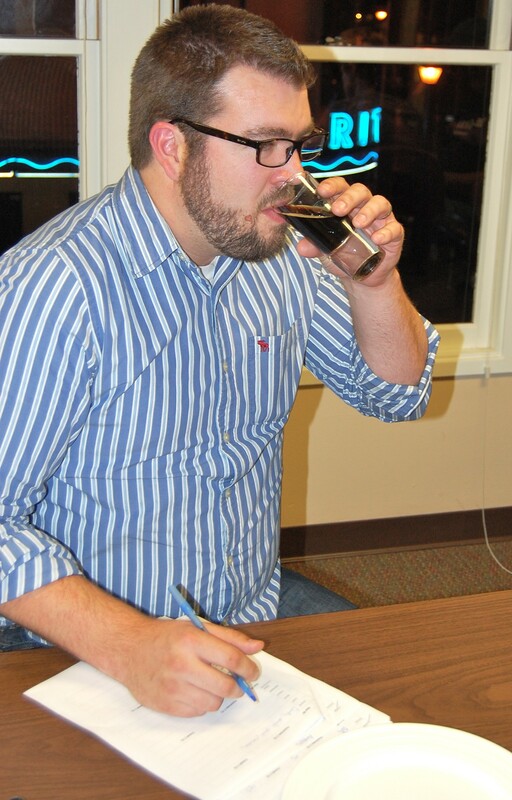 Which local brews impress our experts in a blind taste test, and which are roadkill? Click here to see full beer tasting results. Ron Kuhnel doesn't so much drink beer as he forms fleeting, intimate relationships with it. Onlookers to these brief but passionate courtships will note that fully four of his five senses become engrossed, with only his ears forced to sit on the sidelines. If beers audibly communicated, surely he'd listen. Kuhnel first holds the object of his potential affections up to the light, inspecting its purity from several angles before bringing it down again. His Zen-like approach to drinking beer, a pastime others approach so flippantly, demands the attention of nearby consumers. "You gotta finger your beer, right?" fellow beerhead Joe Wasetis playfully remarks, already familiar with Kuhnel's personal wooing methods. Sure enough, he confidently sticks a thick index finger straight down into his glass, stirring it gently to produce slight agitation and releasing fuller aroma. He ends the step by inserting his beer-moistened digit into his mouth, pulling it out again to a light "pop." When he then brings the glass to his nose he doesn't hold back -- you get the impression that if he could fit his entire head into the glass he would. The first inhale is followed by a look of intense consideration. Is this the one? Then, another inhale or two. By the time Kuhnel finally takes a sip, he's really just confirming suspicions about their compatibility. As the beer slides down his throat he draws his cheeks back into what at first looks like a smile. He's actually taking in air through his teeth, savoring the aftertaste. Come to think of it, he's probably smiling too. Dude really loves beer. Are your personal beer drinking habits this intense and liturgical? No? Well, my friend, that's why we didn't ask you to be on our panel of beer experts for the North Coast Journal's first ever Blind Beer Tasting. Keep practicing. About a month ago now, the Journal dropped its annual Best Of Humboldt Readers' Poll issue to, No. 1, again honor our local good stuff and, No. 2, capitalize on the truth that humans love the inherent drama served up by declaring absolute winners and de facto losers. Subjective glory was bestowed, dreams were crushed. What a time we had. In one of the higher profile Best Of category races, Lost Coast Brewery's Great White took the "Best Beer" distinction, walloping Mad River Brewery's second place Steelhead Pale Ale ... by a 0.9 percent margin. Maybe "wallop" is strong. Great White's triumph is hardly surprising if you think about it. (Take a second and think about it. ... See.) 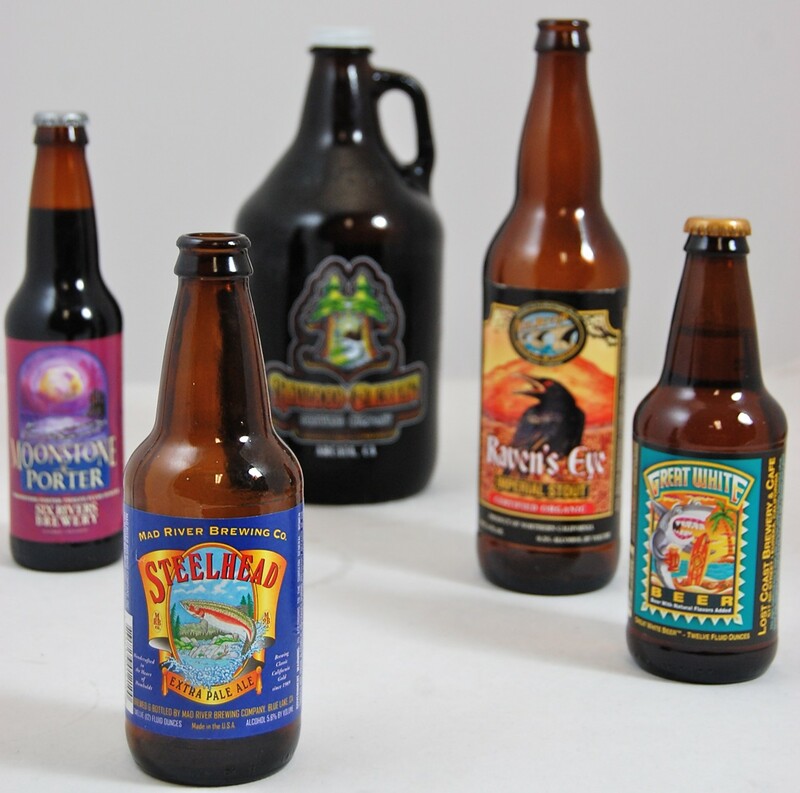 For starters, it's the most visible, widely available, broadly distributed beer produced by without-question the largest of Humboldt County's five breweries. You'd be hard pressed to find an establishment locally with beers on tap that doesn't carry it. As is true in politics, you can't win a popularity contest if no one knows who you are. Obviously "best" is a silly, subjective, unhelpful word. It might be more accurate to label Great White -- and the lovable Flatmosian shark caricature that adorns each bottle -- Humboldt's beer ambassador. Serious beer drinkers can frequently be heard dissin' Great White. But let's be clear: It's not Great White's perceived prominence but the beer itself that induces grumbling from below. The same accessible, light citrus flavor that makes Great White so drinkable for casual-to-non beer drinkers invites derision from the beer connoisseurs. So, we thought we'd give the other side a chance to declare its champion. With the opinions of the masses already in the record books, let's find some of Humboldt's more opinionated beer palette proprietors and give them a megaphone to weigh in on Humboldt's best cold ones. But how to coax their superior beer knowledge from them? Hmm. In an area that so gloriously overachieves in beer production, it wasn't too taxing to assemble a panel of people with large beer vocabularies willing to drink complimentary Humboldt brews. We called one guy we thought might be good. He recommended another guy. That guy recommended yet another guy. You get it. Seven years ago Ron Kuhnel of Eureka embarked on a modest mission to taste every local beer -- but forgot to stop. He's gone on to taste and review approximately 2,350 for ratebeer.com. Kuhnel, 71, also gets extra points for owning and supplying the box full of 4 ounce taster glasses for our evening o' brews. 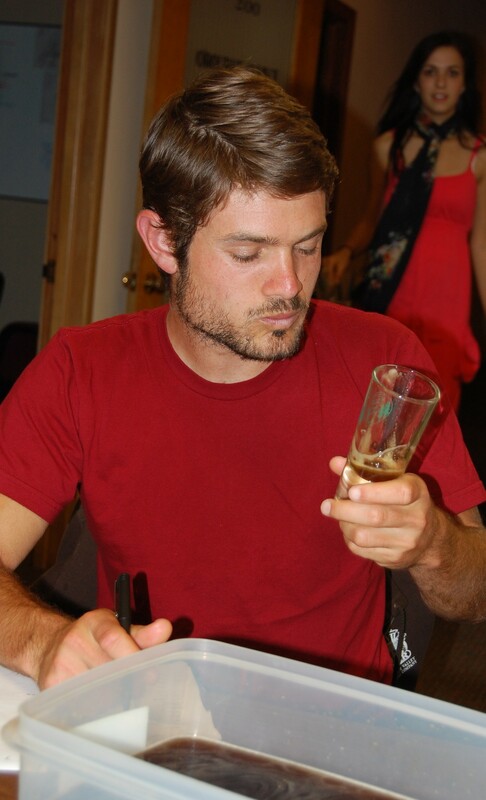 Patrick Hawkins, 21, of Arcata previously worked at Lost Coast Brewery and is an active Humboldt Homebrewer. Like all serious beer drinkers, he dreams of one day operating his own beer-making enterprise -- a nonprofit brewery, if he can figure out how to pull it off. One of Humboldt's handful of active tweeters, 31-year-old Nate Downey of Rio Dell has no problem waiting for a good thing. His personal beer cellar contains around 80 beers he's aging to perfection. As pastor of The Town Church, he's especially passionate about the instant community that drinking beer together easily seems to produce. When he's not slinging low-key one-liners as part of the local "Ba-Dum-Chh" comedy crew, you might find 31-year-old Joe Wasetis of Eureka home brewin'. His "Shiver" strong ale, which he concocted up at Six Rivers Brewery, took "Best in Show" at a home brewers' competition held at Redwood Acres Fair two years ago. A beer traveler and serious cyclist, 30-year-old Kevin Wright of Eureka regularly caps his bike rides with beers with his amigos. Also, traditional Christmases at home include the drinking of 24 22 ounce bottles of beer and drunken snowman construction with his brother. To break it down: These guys love beer. We had beer. We got along. 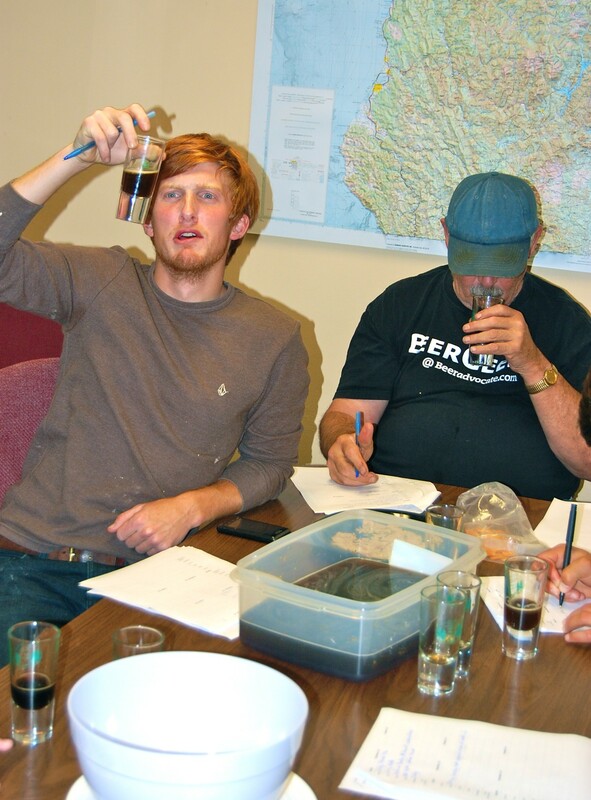 Our tasting took place on a Wednesday evening in the North Coast Journal's offices in the heart of Eureka's Old Town. By Humboldt County standards, NCJHQ offices are pretty swank. (We've got windows, we're upstairs, our carpets are new and unstained. Nice joint.) But the place is hardly set up for beer tasting. It's an office. The details we had to improvise to make our sudsy smackdown run smoothly might not have appeared especially chic, but trust me, we killed it: "OK, we need a way to covertly get the bottles and growlers from the kitchen to the "tasting room." Got it! Empty out that blue recycling bucket and throw some ice in it! Crap! Gotta have some place to conceal the beer while it's poured. Oh, lean those two corkboards against each other on that desk for a makeshift secret beer cubicle. Ah! What if they don't finish their glass and wanna dump somewhere? That plastic bin we keep our hot cocoa packets in will do the trick." So pro. Eat your heart out, Great American Beer Festival! As the judges arrived, camaraderie developed faster than a head on a snappily poured beer. While there had been a few connections among them before beer night, within minutes their individual passions for drink spilled forth as they conversationally explored each other's favorite beers. With our impressive collection of beer IQs assembled, bid-ness was gotten down to. A blind beer tasting seemed the best way to eliminate any preheld brewery biases. In an attempt to give local breweries equal chances at beer snob glory, we decided to limit our scope to the types of beers most commonly produced by our local ale artisans. 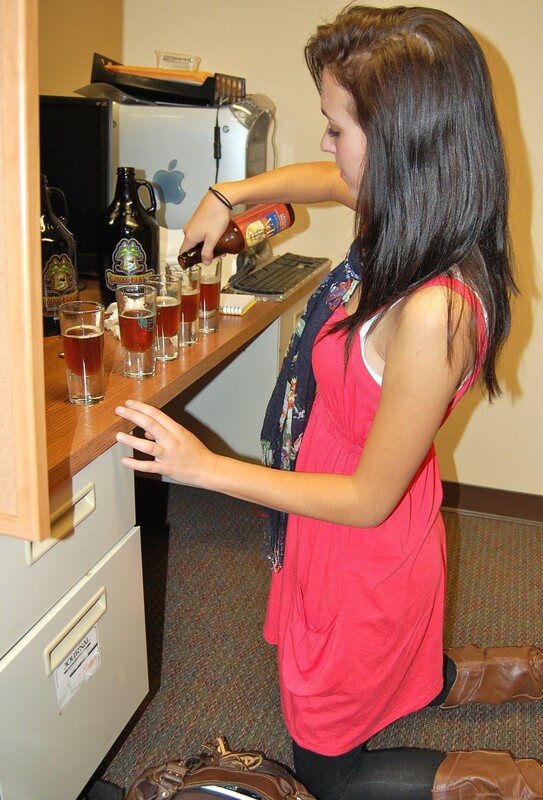 Five palette prodding categories were selected: amber ales, IPAs, pale ales, porters and stouts. Judges were informed when we moved into each style, and beers of the same style were served consecutively. We would have done more styles, but some of us had to drive home. Ballots were distributed asking our judges to comment on a myriad of attributes: aroma, color/appearance, body and flavor. It was a lot of paperwork, mainly intended to restrict any "fun" the judges might have thought they'd have. "Do you want it written out ‘s-u-c-k-s' or will ‘s-u-x' work?" Kuhnel asked before we started. We begrudgingly indicated that we would accept his slacker shorthand. A potential drawback to our system that we'll point out before you do: Some prominent local selections were absent. Why? 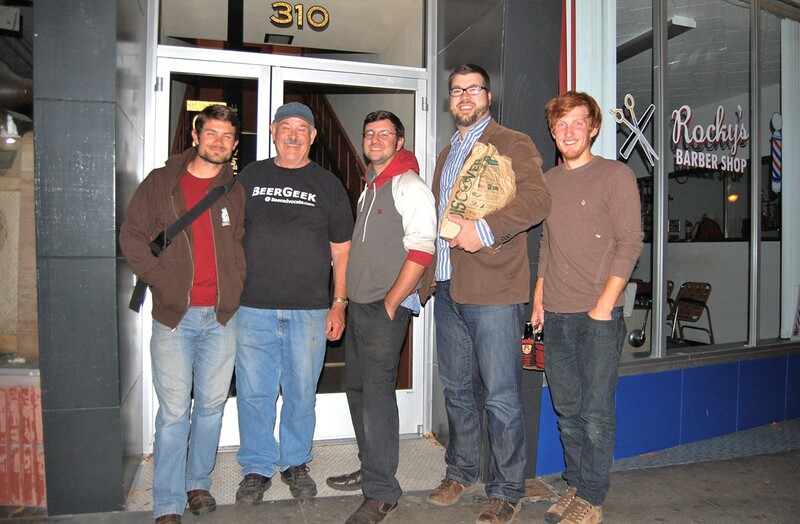 For example, a beer like Eel River Brewery's Triple Exultation -- an old ale boasting 9.7 percent alcohol by volume (ABV) and conceivably a potential favorite of this group of aficionados -- was left out of our contest since, as the only locally produced beer of its style, it would have been too easily identifiable and would have defeated the purpose of the exercise. We think. Beers were served straight from the bottles with the exception of growler-ed selections that came from Redwood Curtain Brewery (they don't bottle) and one Six Rivers brew (we couldn't find any bottled Bluff Creek). We also tried to get tricky. In each grouping, we served one of the beers twice so that if any of our judges were dealing out arbitrary adjectives, we'd know it. In a couple instances we also inserted wild cards into the mix, like when we served Great White amongst the pale ales. In the end, most of our attempts to deceive this way were sniffed out. Tough room. Oh, and there were chips and crackers for peeps to eat. Ritz, Cheetos and Tostitos to be precise. Now you know. We started off with the ambers. Patrick Hawkins's girlfriend Amanda Sheltman helped pour, serve and wash glasses -- she'd tagged along hoping to observe the proceedings for a paper she was writing for her anthropology class. 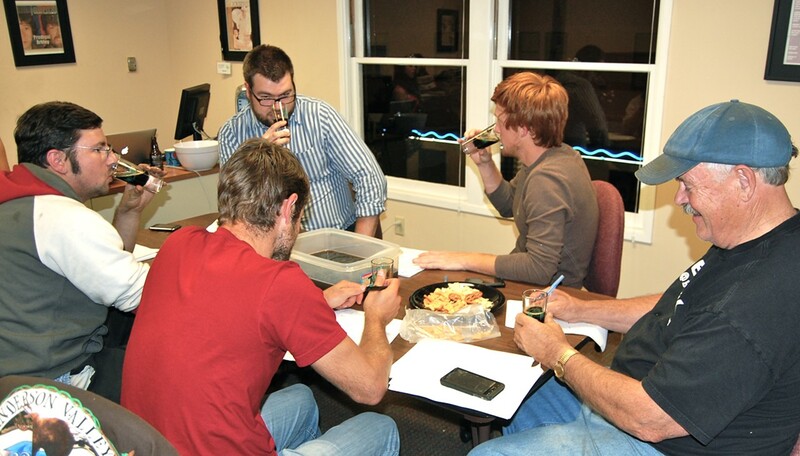 The judges remained mostly silent throughout the first couple of beers -- they were taking this really seriously. As you might expect, lips loosened as the night wore on. "I'm not a real amber fanatic." Kuhnel announced at the end of group one. "Probably 80 to 90 percent of the ambers I drink are not well done. When they're well done they're a great beer." "If I go to a barbecue, an amber is the least likely to get picked out of the cooler," Downey said. Got it. A roar of approval went up from the panel as the night's IPA section was announced. Whereas portions of amber glasses ended up in the "vat o' death" in the center of the table, most of the IPAs disappeared into actual mouths. The judges' passion for this style significantly increased the cross talk and boasting about the erudition of their palates. "This has the same hops as the first IPA," Hawkins declared. "I think it's Cascade." "That's something I have not gotten into, identifying individual hops strains," Downey confessed. "Any west coast IPA, you almost have to put Cascade in it," Kuhnel declared. Brewers add the hops -- actually just the little flowers from hop plants -- into their creations to help preserve the beer and add a bitter tang. The boys dig those hops! On Redwood Curtain Brewery's rise: "They're striving to make all different kinds of beers, they're doing dry hops stuff every week, they're doing barrel-aged stuff all the time," Downey said. "I think they've raised the bar for Humboldt County brewers who say ‘Oh, we can't just make an amber, a stout and a pale ale and sit back for 10 years?" On the pleasures of the "old days" at Mad River Brewery: "They used to have lots of sediment at the bottom. You'd find all sorts of stuff down there -- people's wedding rings," Wright offered. On Great White's prominence: "There's a lot of women in Humboldt County," Hawkins elegantly tongue-in-cheeked. On Eel River Brewery's organic approach: "I think that's why they're so wildly inconsistent," Downey said. "Getting organic hops is so difficult. You're getting them from different regions at different times. Just for the sake of being organic you sacrifice consistency." On Six Rivers Brewery's style: "I feel like they make their beers too sweet," Wright opined. For each successive beer group, tasting seemed to pass more quickly. As beer fatigue set in, the drinking and writing pace increased. Pale ales, porters and stouts! Oh my! A review of the ballots revealed an increase in sloppy penmanship as the night wore on. Go fig. When we ran out of beers to skewer, pens were confiscated, the veils were lifted and we confessed that some beers had been doubled. "I knew it!" Hawkins literally screamed. "You triangulated, you rat," Kuhnel added, in reference to our implementation of such a sneaky beer data gathering method. The biggest shocker of the night seemed to come when it was revealed that "Beer No. 5" of the IPAs -- "Five was definitely Redwood Curtain," Hawkins predicted before I could even read off the answer -- had, in fact, been Lost Coast's Indica. "No way!" Downey yelled -- up to that point he'd been nearly perfect in his predictions. "Wait, whoa, whoa, back up," Hawkins pleaded. "You're saying that No. 5 was Indica?" "What?" he said sinking back into his chair. "I rated that one..." he trailed off, unable to finish his thought. The numbers don't lie, folks. Patrick Hawkins likes Indica. Religion denied. As one might have expected with this group, Redwood Curtain Brewery came out as the big winner of the night, with two beers placing highest in their respective categories and two others coming in second (see that chart!). Here's where we fall in that "best" trap again. If, and only if, you're pushy and demand that an overall winner must be declared, by sheer numbers, this batch of Eel River Brewery's Organic Raven's Eye could be declared Humboldt County's best beer. "Could be." Of course, that presupposes that you believe that drinking and numbers should ever be anywhere near each other. The number "0.08" comes to mind as perhaps proof that they shouldn't. But it's your life. Okay, okay. Long live the Raven! ... ‘s Eye. Hip, hip. As the night came to a close, rides were called in, phone numbers were exchanged and "That was fun" sentiments were exhaled. As we left the Journal offices, the five slightly toasty warriors posed in solidarity for one final photo to commemorate the experience. One thing was certain: They would never be as welcome in all of Humboldt's breweries as they had been before they pronounced their verdicts.